Goal: Authenticate using HotSpot 2.0, 802.11u, and 802.1x EAP-TTLS and EAP-TLS. Requires LANforge 5.2.10 or later. Create a Virtual AP configured for HotSpot 2.0 and RADIUS (802.1x) authentication. 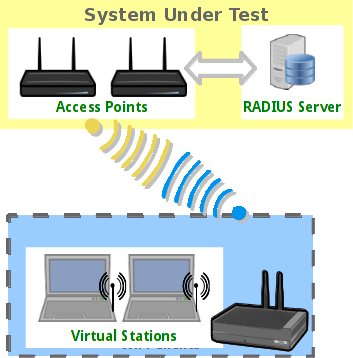 Create two Station interfaces, one connecting with EAP-TLS and one with EAP-TTLS. This example uses two LANforge CT520 systems but the procedure should work on all CT521, CT522, CT523, CT525 and similar systems. Go to the Port Manager tab, select wiphy0 on proper resource, click Create, fill out appropriate information and create basic Virtual AP interface. Use Netsmith to create Virtual-Router. 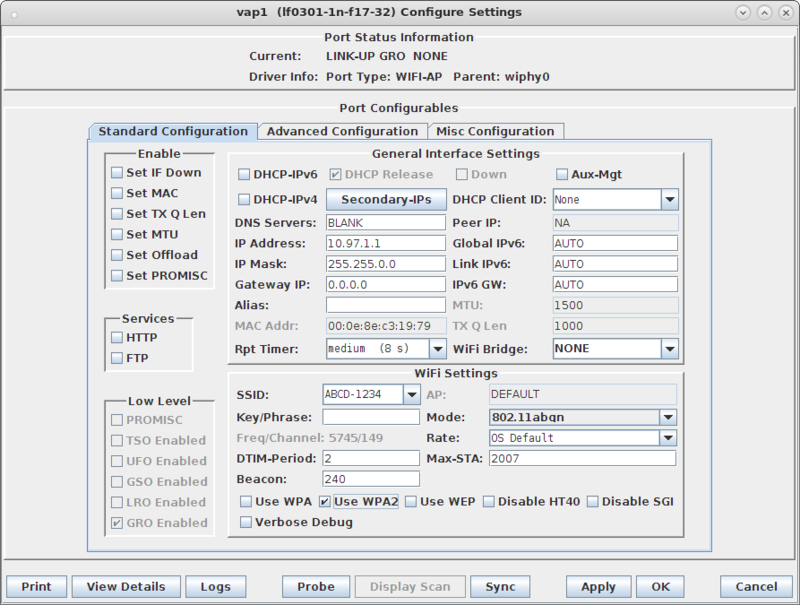 Add the vapX interface to the Virtual router, configure the Virtual Router port object to serve DHCP. Optionally, add external Ethernet interface to virtual router so that it can route to upstream networks. You could also set up the VAP in bridge mode and use external DHCP server if preferred. 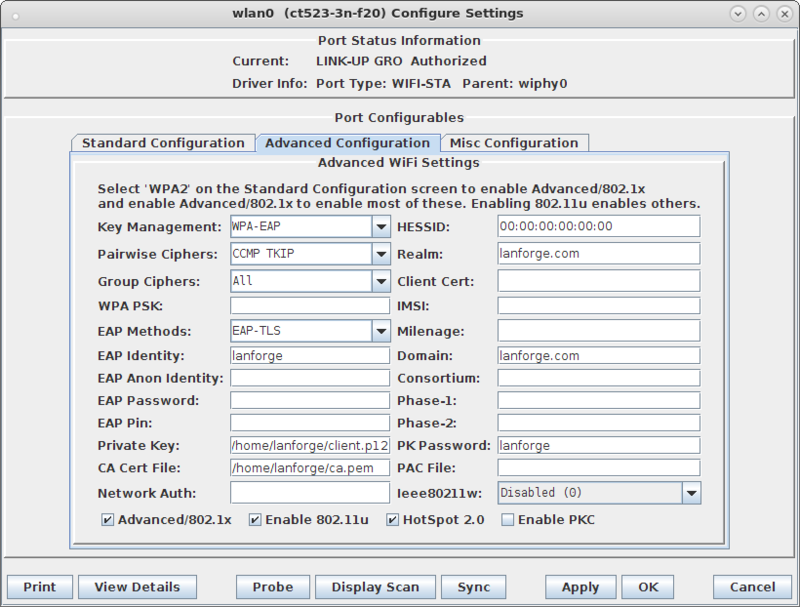 Create EAP-TLS (key certificate authentication) Station on wiphy0 of the second LANforge Resource. Go to the Port Manager tab, select wiphy0 on proper resource, click Create, fill out appropriate information and create a basic Virtual Station interface. 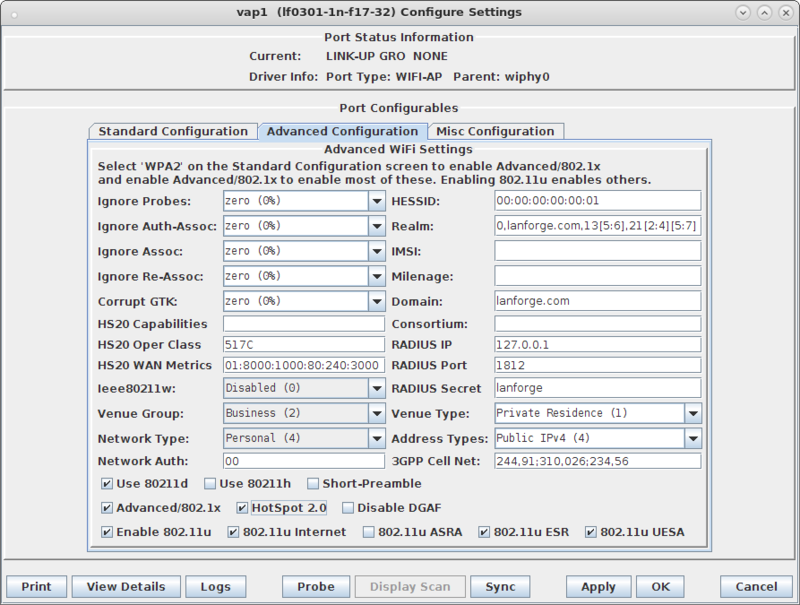 Select the Advanced Configuration tab in the Port-Modify window and configure the 802.1x, 802.11u, HotSpot 2.0 and other information. The EAP Identity is required, but it may not matter what value you enter unless your RADIUS server has specific requirements. The LANforge RADIUS server does not care. The Private Key and CA Cert File should come from the /home/lanforge directory on the RADIUS machine if using LANforge for the RADIUS server, or from your own RADIUS server's machine if using your own RADIUS. 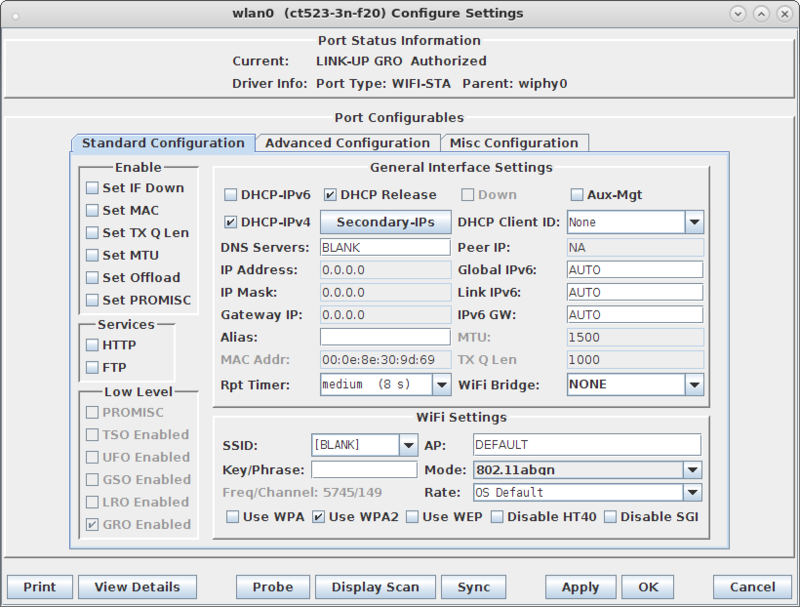 Verify Station connects and obtains DHCP IP Address configuration. 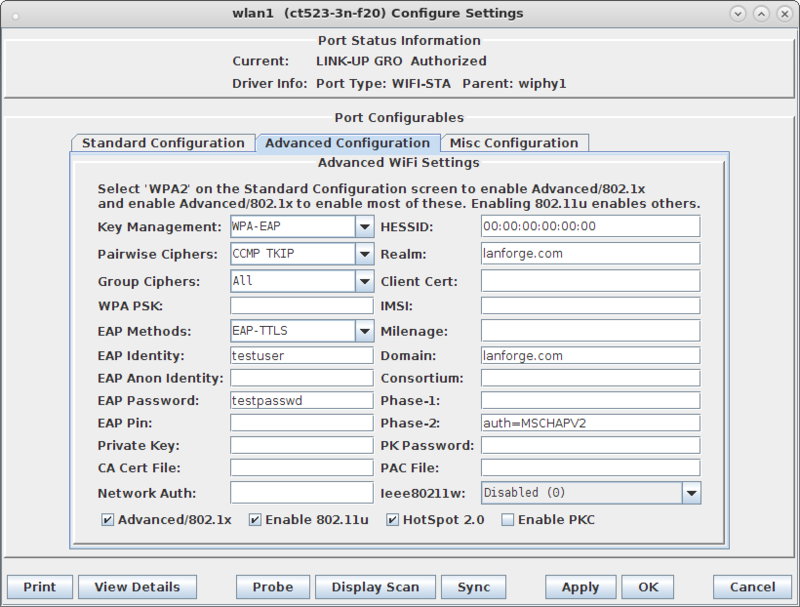 Create EAP-TTLS (802.1x username + password authentication) Station on wiphy0 of the second LANforge Resource. Go to the Port Manager tab, select wiphy0 on proper resource, click Create, fill out appropriate information and create another basic Virtual Station interface. Select the Advanced Configuration tab in the Port-Modify window and configure the 802.1x, 802.11u, HotSpot 2.0 and other information. The EAP Identity and EAP Password must match the configuration on your RADIUS server. LANforge RADIUS defaults to: testuser, testpasswd when freeradius is installed via lf_kinstall.pl --do_radius. Phase-2 must be configured as shown for EAP-TTLS with MSCHAPV2.